The newest gold skeleton key boss gives us a blast from the past. Are you ready to confront some familiar foes? Once you step inside and use a gold skeleton key, you’ll be face to face with a moon school Mimic (40,000 Health). Don’t get too comfortable though, that will change soon enough. 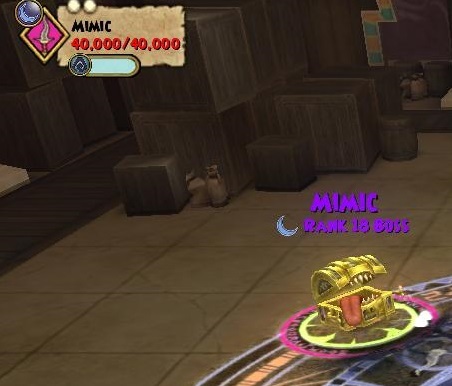 At the beginning of round one, the Mimic will interrupt to say “A Treasure of Tricks!” and transform into 1 of 5 bosses. 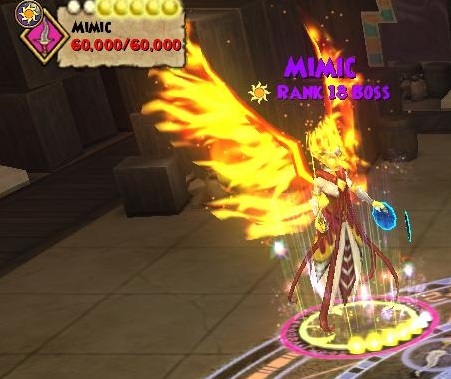 The Mimic will continue to shift into different bosses (seemingly) randomly. I have yet to see a consistent pattern as to when the Mimic changes form. 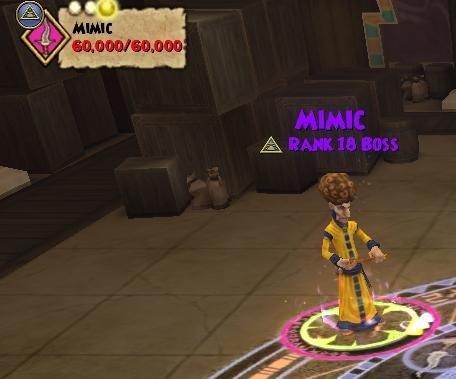 I have yet to see a consistent pattern as to how long the Mimic will stay in a certain boss’s form. If you have any ideas regarding this, I’m all ears! Below are the 5 possible bosses that you may encounter at any time during the Mimic fight. You may see all of them, you may not. Which ones you do (or do not) get seem to be random for now … so prepare for any and all possibilities. Whenever the Mimic transforms into Young Cyrus Drake, it will cleanse all wards currently on it. No other cheats have been observed. 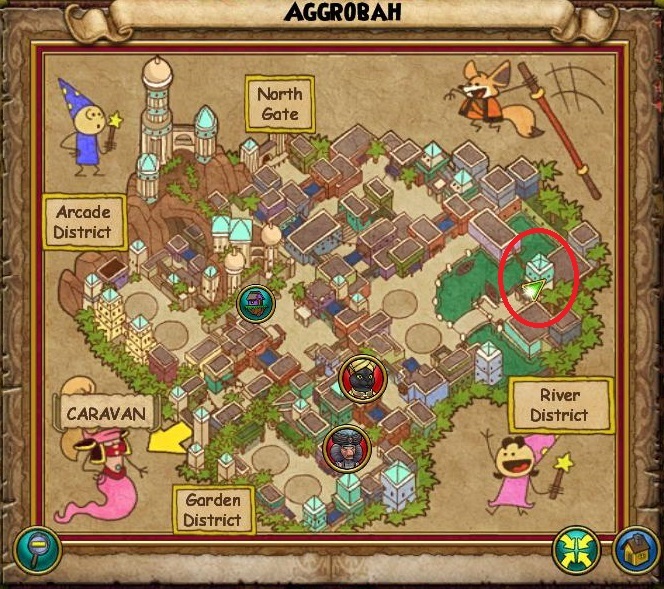 On the round immediately following the transformation, The Gobbler King will ALWAYS interrupt to cast 3 Tower Shields, a legion shield, and an aura. Shortly after the transformation (usually 1 or 2 rounds), Mithraya will interrupt to shout “Protector!” and summon a Stellar Protector (Star, 6,200 Health) to help her. This minion will still be summoned if Ghost Dog’s minions are present (see below). 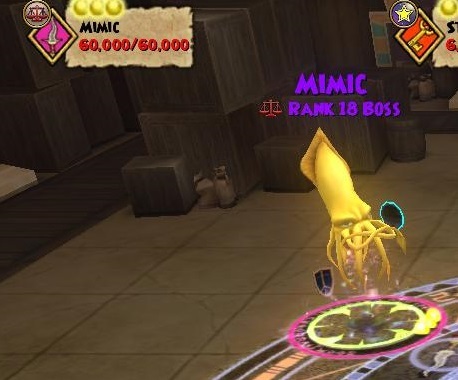 This minion will remain present even if the Mimic changes to another boss. Mithraya will not summon another protector if one is already in the battle. Mithraya will cast a 50% smokescreen every round until ….. When there is at least one trap and one blade active in the battle, Mithraya will interrupt to shout “The cards align! Now’s your chance!” and stop casting smokescreen. Like Mithraya, Ghost Dog keeps his original cheats. On the round following his transformation, Ghost Dog will summon a Hagakure Blade (Storm, 5,750 Health) and a Seijun Killer (Fire, 3,550 Health) to help him. 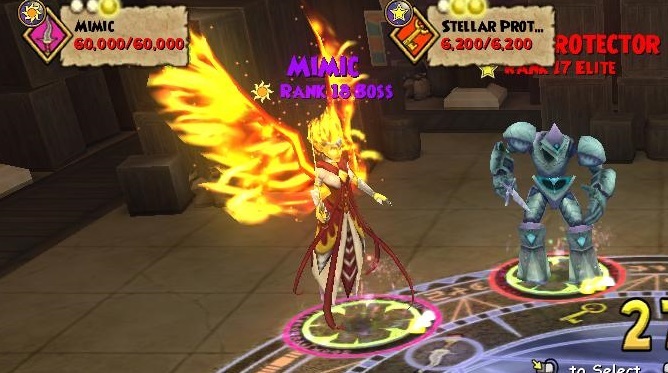 These minions will still be summoned if a Mithraya Stellar Protector is already in the battle. 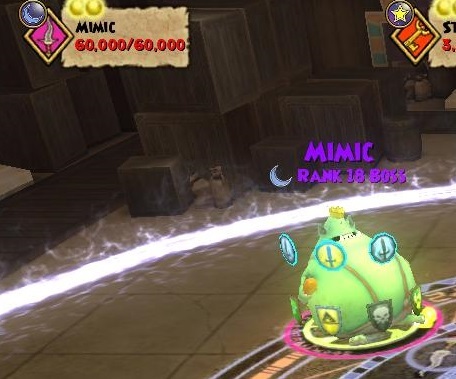 These minions will remain present even if the Mimic changes to another boss. Ghost Dog will not summon more minions if they are already in the battle. At the end of round 2, Ghost Dog will cast a Death Damage over Time spell on one of your team members. This spell will do roughly 400 damage per tick. At the end of round 5, Ghost Dog will detonate the death damage tick – dealing roughly 2,500 damage. (Though I have yet to see the Mimic stay in Ghost Dog form long enough to enact this cheat). If you cast any type of shield, Ghost Dog will interrupt to cast Shatter and remove it. Like Mithraya and Ghost Dog, Luska keeps his original cheats. Luska will remove any traps that you try to place on him. TWO EXCEPTIONS: Pet traps and traps protected with Indemnity! Vaporize can dispel the trap removal. At the beginning of each round, Luska will “ink” (accuracy debuff) the person in the sun spot. Any other players will get a feint placed on them. If a non-inked wizard attempts to single target Luska (attack, trap, weakness, etc…), Luska will remove all wards currently on him and then attack with a Skeletal Dragon or Power Link. Blades, Blades, Blades! 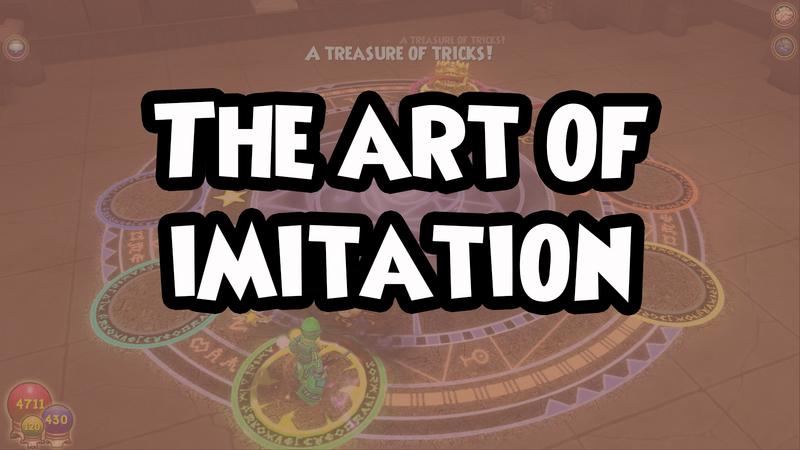 None of the possible enemies have cheats triggered by blades … use this to your advantage. Pet and/or Indemnity Feint on the hit round. You never know when Young Cyrus Drake may be popping up, so feinting early in the battle is risky. Using a pet feint or indemnity feint on the hit round will eliminate the risk and still stick against Luska. Pack Shatter. The Gobbler King isn’t too kind with his shields. Pack Shatter so you’ll be prepared. Infallible/Shadow Shrike is helpful. With switching bosses, it’s hard to keep prisms handy when you need them. Having universal pierce will give you an upper hand no matter who you face. Use an AOE to be safe. You may get minions – you may not. Either way, it’s best to hit with an AOE so you’ll be covered no matter how the battle goes. This battle was pretty hard to cheat test since I couldn’t pick which enemies appeared and when. If you have any additional information, feel free to share!